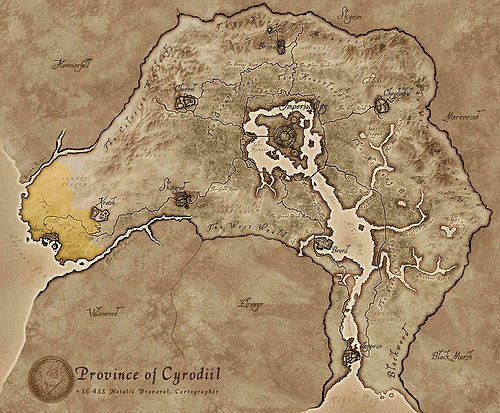 The Gold Coast is a coastal area covering the peninsula on the west coast of Cyrodiil. It is bordered on the west by Hammerfell and the Abecean Sea. The borders of the Colovian Highlands and the West Weald lie to the east. The Gold Road, running from Kvatch to Anvil, cuts through the middle of the region. Within the Gold Coast lie the cities and counties of Anvil and Kvatch. Along the coast itself are plentiful Water Hyacinth plants, along with a few of the elusive Nirnroot. Further inland there is a bounty of Aloe Vera, Fennel, Lady's Mantle and Goldenrod plants - providing ingredients that are rare elsewhere in Cyrodiil. There are also many Arrowroot, Bergamot, Ginseng, Mandrake, St Jahn's Wort and Lily plants, but those ingredients are also found elsewhere. Abecean Sea — Sea on the western coast of Cyrodiil. Newheim's Flagon: A gang of Bosmer thieves has been causing some problems around Anvil.